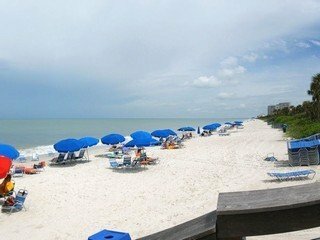 Pelican Bay in Naples, Florida is a gorgeous community situated alongside two and a half miles of white sand beaches on the Gulf of Mexico. Pelican Bay is unique due to it's private beach pavilions, complete with beachfront dining for residents and their guests. There simply isn't anything else like it in Southwest Florida. Pelican Bay is located in North Naples, west of US 41 between Seagate Dr. (the extension of Pine Ridge Road West of US 41) to the South and Vanderbilt Beach Road to the North. Pelican Bay is a private community in North Naples consisting of approximately 91 separate residential condominium and homeowner associations. The area includes a mixture of single-family homes, villas and high-rise condominiums. Nature-filled boardwalks wind through carefully preserved mangrove forests leading to beachfront pavilions and dining on the beach. On the property are three premier hotels, premiere upscale shopping at Waterside Shops, 570 acre conservation area, over 40 acres of parks and nature trails and the renown cultural center, Philharmonic Center for the Arts. Hotels include the Ritz Carlton (supreme luxury, located on the beach at the northern most end next to the exclusive Pelican Bay community of Bay Colony), the Inn at Pelican Bay (located at the northeast end of Pelican Bay) and the Naples Grande Beach Resort (nicely appointed with beach access, located at the southernmost end of Pelican Bay). Amenities in Pelican Bay include everything from beachfront dining to tennis and educational classes. Walk or take the tram to the beach. All you need is a towel and your favorite book. The Foundation provides beach lounge chairs and umbrellas at either the north beach pavilion or the south beach pavilion. Canoeing, kayaking and sailing are also available. There are four beach restaurants that offer casual beachfront dining for breakfast, lunch and dinner. After your meal take a stroll on the beach or participate in beachside fitness classes complete with weights and stretching. Tennis is a true sport at Pelican Bay. The active tennis program includes two facilities and the Pro Shops offer a variety of teaching and league play. The Community Center offers state-of-the-art fitness equipment and services including exercise classes, massage and social and educational programs for members. The common areas and amenities are managed by the Pelican Bay Foundation, Inc., often referred to as “The Foundation.” All Pelican Bay residents pay a fee to The Foundation. Also in Pelican Bay, although separate in management, The Club at Pelican Bay include the scenic 27-holes of golf, plus exquisite dining. Membership to The Club at Pelican Bay is separate and not required of residents as is with the Pelican Bay Foundation.